Seen in charter assignment on a warm and pleasant day sometime in 1948 within the environs of its operating area in the State of Connecticut is fleet # 157 - a 1942 Mack Model 'Improved' LD-3G (the 'improvement being the angled windshield) and one of thirty likenesses delivered in increments between 1941 and 1942 to the Connecticut Railway and Lighting Company's CR&L Lines. The medium duty and quite popular 35 passenger LD-3G, ideal for lighter traffic routes and as a main line feeder, was well powered for any terrain with a 510 cubic inch, 150 horsepower 6 cylinder engine mounted transversely at the rear and coupled to a three speed mechanical transmission with 371 built between 1941 and 1943. It's unfortunate that the image doesn't show CR&L's very pleasing livery in basic cream complimented by fields of a tasteful light green below the belt line. From 1920 until 1936, the Connecticut Co. operated nearly all local railways and buses within the state and was owned by the New York New Haven & Hartford Railroad, which operated nearly all main line passenger trains within the state. One company was thus able to control nearly the entire public transportation system within Connecticut. During that period, the Connecticut Co. also leased all lines owned by Connecticut Railway & Lighting Co. But in 1936 after the Connecticut Co. was failing to make its lease payments to Connecticut Railway & Lighting Co., the courts allowed Connecticut Railway & Lighting Co. to repossess the leased lines. Connecticut Railway & Lighting Co. was a subsidiary of United Gas Improvement Co., and was incorporated in 1895 as The Gas Supply Co., in 1899 renamed Connecticut Light & Power Co. when company acquired its first electric railways, in 1901 renamed Connecticut Railway & Lighting Co.
Photo courtesy of 'Vintage-Vault75 ' and is up for bid on eBay as item # 170962413934. Sitting at the corner of Boston Avenue and Brooks Street in Bridgeport sometime in the forties and signed for the then nearby General Electric plant is fleet # 72 - a 1940 Yellow Coach Model TD 4001 and one of twenty likenesses numbered 60 to 78 delivered in increments between 1940 and 1941 to Connecticut Railway and Lighting (CR&L). The aluminum bodied 40 passenger Diesel powered 4001 series was among the very first of what Yellow termed as their new 'streamlined' design for the 40's that we now refer to as being 'Old Looks'. An oddity with number 72 would be a very rare set of markers placed just over either side of the destination sign which may have had some special purpose in CR&L's operation. Shortly after the 4001's came to market, the war effort changed the construction of Yellow Coaches to all steel bodies devoid of any stainless steel or aluminum fittings either inside or out. Photo courtesy of 'Vintage-Vault75' and is up for bid on eBay as item # 170968977995. Adding to our collection of vintage Connecticut Railway and Lighting Lines (CR&L) equipment, we see fleet #88 - a 1942 36 passenger Yellow Coach (GM) Model TG-3606 and one of fifteen likenesses numbered 85 to 99 delivered to the Bridgeport based company in December of that year. The United States was already embroiled in two theaters of war at the time and aluminum, an integral part of Yellow's new monocoque (now Old Look) design introduced in 1940, was directed to the war effort forcing the manufacturer to turn to body panels of thinner gauge steel as evidenced by the addition of a second side swipe molding between the wheel wells. These buses also carried either wooden or painted steel passenger hand rails and seat backs in place of stainless steel. Of note on #88 is the unusual (for the time) undivided destination sign glass, the lack of any exterior bright work and the manufacturer's marque in the form of the initials (Y over C) in a small medallion over the right headlamp. 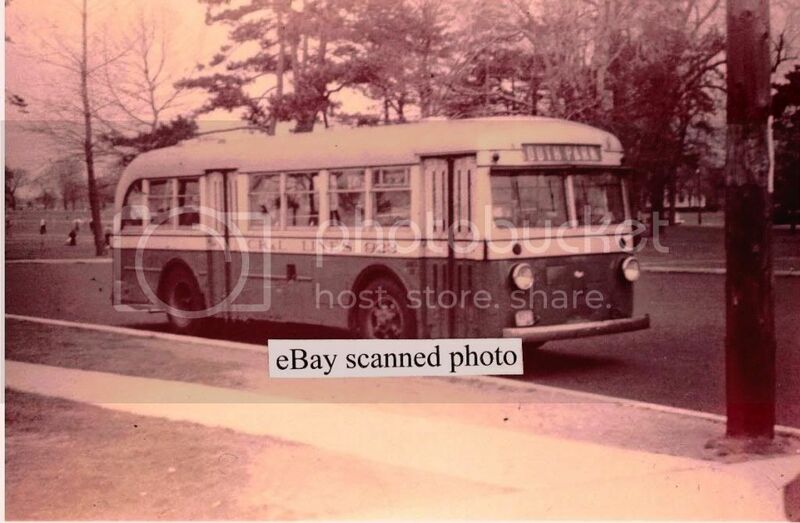 Photo courtesy of '4509bus' and is available at eBay as item # 350962475745. Seen sometime in the forties with a heading South Park is fleet # 923 - a 1937 31 passenger Mack Model 6CQ-3S and one of 50 likenesses operating for the Connecticut Railway and Lighting Company (more commonly known as CR&L Lines) of Bridgeport, Connecticut. The Model CQ of 1937 was a more sculptured version of its boxy predecessor and an exact replica of its close cousin model CT but only one window shorter. The CQ derived power from a 468 cu. in. 118 h.p. gasoline engine mounted transversely at the rear and combined with a three speed mechanical transmission. Very popular among smaller operators as a mainstay or as a feeder to trunk lines of heavier properties, nearly 900 of the model in both earlier and later design were sold between 1934 and 1941. I remember these buses at local western Connecticut railroad stops on my way by train to Massachusetts to visit family when I was a kid and they were very pleasing looking in a cream over pale green. Photo courtesy of '4509bus' and is available at eBay as item # 371011041655. Seen sometime in the fifties at its company facility is fleet # 107 - a 1941 36 passenger Yellow Coach modeled as a TD 3602 and one of ten likenesses numbered 101 to 110 operating for Connecticut Railway and Lighting Company (flagged as CR&L Lines) of Bridgeport. The short lived aluminum bodied 3602's, with only 67 built between late 1940 and mid 1941, were superseded by the 3605's and 3606's in which light weight steel replaced aluminum and stainless steel components needed for the war effort. Still carrying its original Yellow Coach badge under the windshield, # 107's directional signals have been updated to meet a mid fifties federal mandate. The mystery surrounding the two special factory installed blue lights (one over each end of the destination sign) and which seem to appear on all Connecticut buses of the era has still not been solved! 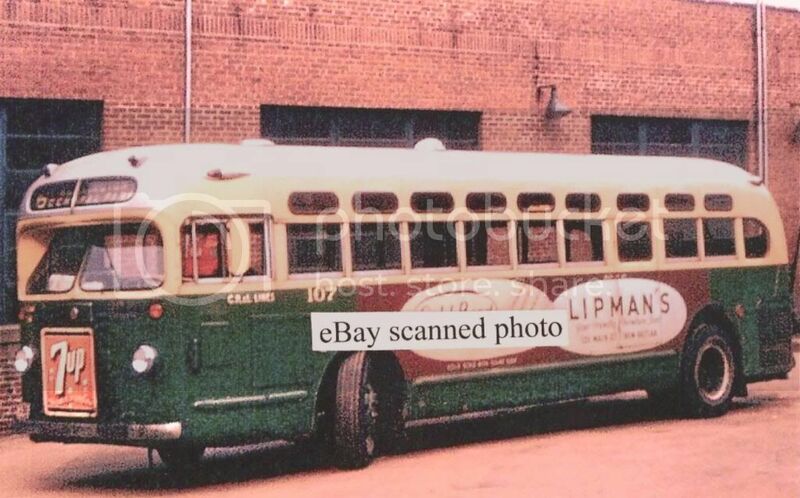 Photo courtesy of '4509bus' and is available at eBay as item # 371014278566. 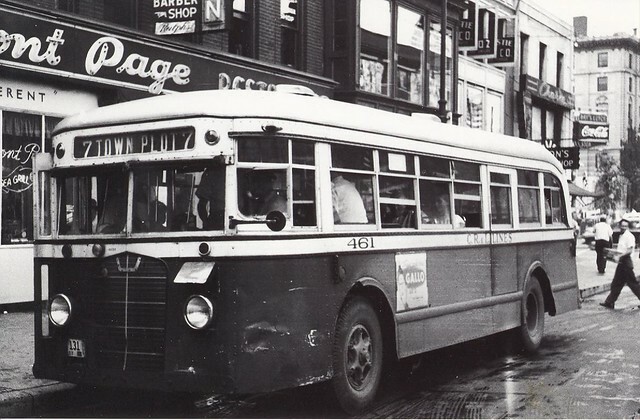 Between 1935 and 1937, Connecticut Company purchased about 46 buses from ACF. They included models H-13-S, H-15-S and H-17-S. This was during the period when Conn. Co. (and parent company New Haven Railroad) were in bankruptcy, and many of these buses were turned over to CR&L when the court broke the 1906 lease of CR&L's properties to Conn. Co. In some cases, buses ordered by Conn. Co. were delivered new to CR&L. 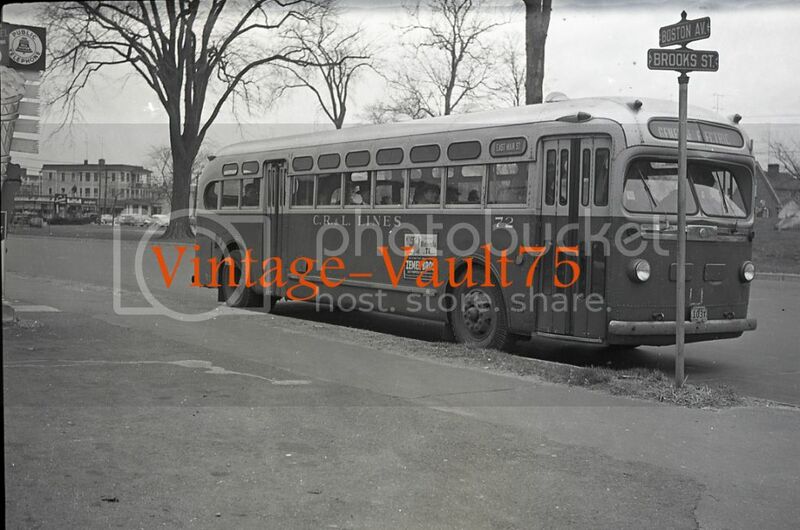 The picture below shows CR&L #461, an H-17-S (serial #399), originally owned by Conn. Co. with the same fleet number, on Bank Street at Exchange Place in downtown Waterbury on the Town Plot route. I believe that this picture was taken somewhat later in the ACF's career, as the destination sign includes a route number. Most other pictures that I have seen of CR&L ACF's had destinations with no number included. I hope that Mr. L or one of our other members can provide some more info on the ACF. The all time roster of The Connecticut Company does show 15 1937 ACF H-13-S's numbered 400 to 414 and 11 H-15-S's numbered 450 to 460 purchased between 1935 and 1936 but shows no mention of pictured # 461. # 461 most closely resembles a 35 passenger model H-17-S built sometime between 1935 and 1938. The roster I have (from the R. Patrick Stanford book "Formation & History of The Connecticut Company and Connecticut Railway & Lighting Company") shows fleet # 461 - 467 as H-17-S models that went to CR&L. These were possibly delivered new to CR&L and never ran in Conn. Co. service. When I was growing up in the 1960's, my neighborhood bus line (and now my employer), North East Transportation, still ran several H-17-S ACF's, including 4 of Connecticut Company vintage. They were always a favorite of mine, and when I knew one was in service, I would let the newer GM diesels pass in order to ride on one. The last of the North East ACF's was retired around 1970, and now resides at the Connecticut Motor Coach Museum. A great bus! You are correct - I did find #461 on CR&L's all time roster. 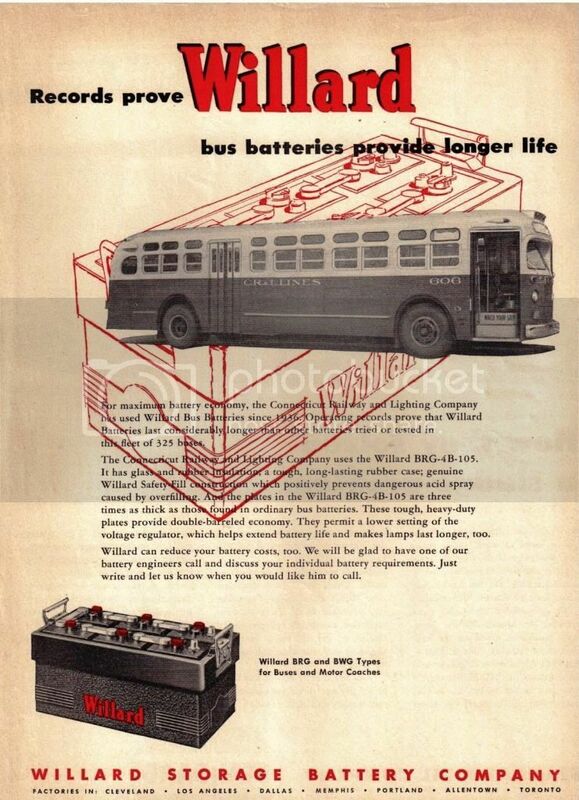 Seen below is an ad that appeared in Bus Transportation Magazine in the very early fifties extolling the virtues of the company's very reliable Willard Storage Batteries built specifically for buses and showcasing Connecticut Railway and Lighting Company (CR&L) as a satisfied customer. 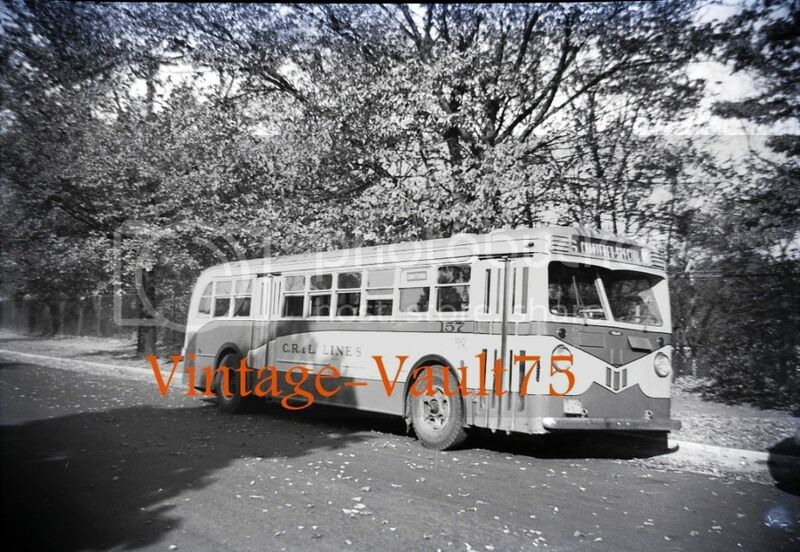 The bus in the image is CR&L fleet # 606 - a 1950 45 passenger GM Coach modeled as a TDH 4509 and one of thirty-five likenesses numbered from 601 to 635 delivered in increments between 1950 and 1951 to the company's Bridgeport office. Strangely, the very popular hydraulic version of the 4509 series with 2500 built and the first to be mass produced in the updated paired window design, only sold the thirty-five mentioned above in the Nutmeg state. 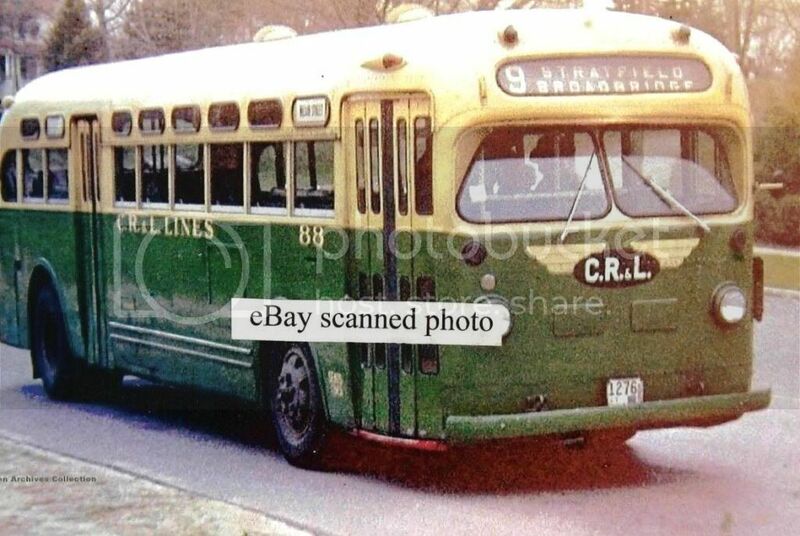 Photo courtesy of '4509bus' and is available at eBay as item # 371061595280.